Over the past few weeks, I have noticed the number of daily readers on the blog has increased by over 300 percent. "Wow!" I thought to myself. That it some really great news. The more I thought about it, the more I wanted to extract a lesson from it all. What valuable nugget of wisdom could I impart to both myself, for future reference, and to others? Answer: Light more fires! What does that mean? You ask. Good question! For those in sales, it means talking to more people. For bloggers, it means writing more articles. For those trying to lose weight, it means being more active in the gym while also managing a balanced diet. In short, lighting fires involves the increase of activity. While simple to understand, the lesson is powerful. By increasing our activity, we in turn create more results. These results can be understood as building blocks toward our goals. 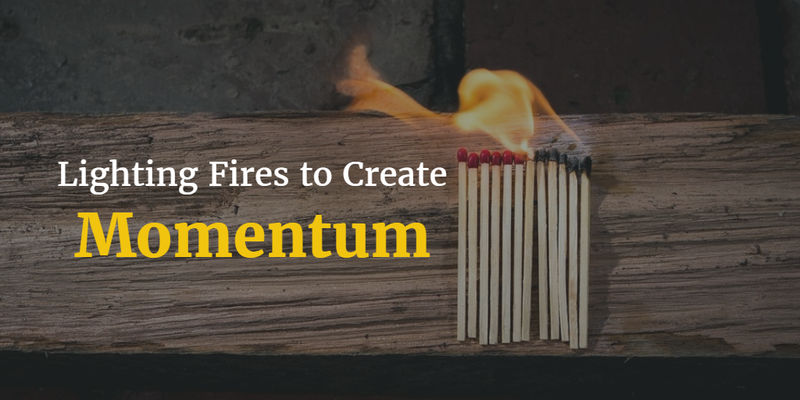 To put it another way, we can describe this increased activity and its related results as momentum. Please know that in the beginning, it will take far more energy to get things going (with fewer results), but eventually it flips to the point that it will take far less energy to maintain and grow it (with greater results). The secret to success is consistently taking massive amounts of action each day. Eventually, with enough care and attention, the growing number of small flames will become a raging blaze. While a very quick and easy read, I hope that you got something of value. If you did, please share it online or via email with someone who you think would benefit from it.